Note: The following sections for October 2006 were written in December 2006. As you read through them you will begin to see why they have not been published until 2013. The 1910 census for the state of Kansas lists a Clement Hanney b. 1888. He states his place of birth as Missouri with a father born in Illinois and a mother born in Ireland. Clement Hanney's occupation is a bricklayer. This Clement Hanney is a prisoner at the United States Penitentiary at Leavenworth, Kansas. Prior to 1897 the United States government ordered that a new penitentiary be built in the Leavenworth area. One purpose of the new penitentiary was to allow the government to separately house the prisoners held by the military from the prisoners in federal custody for civil and criminal reasons. If a person was convicted of a crime against the laws of the federal government that person would be sentenced to serve their prison time at a federal prison. Crimes committed on or against federal property are included in the many reasons a person might find themselves indicted and convicted of a federal crime. In 1897 construction on the new penitentiary was started. Initially, work progressed slowly because the construction work was being done by the prisoners held at the "old" penitentiary at Fort Leavenworth. By 1903 enough of the prison was completed to allow prisoners to be housed at the new penitentiary. This allowed work to progress at a faster pace since the prisoners did not have to be marched each day from the old prison to and from the construction site. While doing some internet searches for information on the penitentiary at Leavenworth I happened to come across an index of prisoner names and the inmate number assigned to the prisoner, with no corresponding dates of imprisonment shown. The index shows five prisoners with names that might be of interest. There are two prisoners named Clem Hanney, one prisoner named Will Hanney and two prisoners named William Brady. The index covers the years 1895 to 1931 so I don't know which of the prisoners might be the Clement Hanney listed on the 1910 census. Some additional research shows there are prison inmate files for Leavenworth penitentiary at the National Archives - Central Plains in Kansas City, Missouri. I ordered one of the Clem Hanney files from the National Archives to get an idea of what information may be in the file and whether or not that information would provide any further clues to Clement Hanney and perhaps William Brady. Upon my return from my San Francisco trip the first Clem Hanney file from the National Archive has arrived in the mail. While I was in San Francisco I had decided to order from the National Archives the other Hanney and Brady inmate files. Who knows how long it might take the National Archives to locate, copy and mail the files I've requested so I ordered all the remaining files to speed up the process. The first Leavenworth file on prisoner Clem Hanney, inmate number 6239, shows that he was arrested in St. Louis, Missouri on 6 July 1908 for burglarizing a post office. He was sentenced on 1 December 1908 to a three year confinement; Clem Hanney is shown in the record to be twenty-one years old. A photograph, mug shot, is included of Clem Hanney that cannot be said to be our William Brady. Clem Hanney's three year prison term is set to expire on 30 November 1911; however there is a "Good Time" release date of 23 March 1911. The prison work record shows that Clem Hanney was assigned to various work details that included the "construction site", quarry and crusher gang. As part of the file there is a log of mail sent and received. The mail log shows Clem Hanney sending a letter to his father, James Hanney of St. Louis, Missouri on 1 August 1909. In 1910 Clem Hanney writes letters to his father on 24 April and 5 September. There are no letters from James Hanney to Clem in the received mail log. On 14 September 1910 Clem received a letter from his sister, Loretta, of St. Louis, Missouri. This begins a series of letters between Clem and Loretta for the rest of 1910. On 30 December 1910 Clem receives a letter from his mother postmarked St. Louis, Missouri. The mail log for 1911 shows Clem writing five letters to his mother and he receives three letters in response. One letter is written to a brother, Frank Hanney, in St. Paul, Minnesota. Clem Hanney wrote to his mother on 12 March 1911 for the last time and on 16 March 1911 received the last letter from his mother. The letters to James Hanney, Loretta and Frank make it certain that this Clem Hanney is the same Clement Hanney born 23 November 1888 to James Hanney and Nora Toohey Hanney. The "mother" that the letters are written to would be Kate Hanney, James' second wife after the death of Nora. There is a letter from the United States Attorney's Office dated 14 March 1911 to the warden of Leavenworth Penitentiary. The letter states to the warden that the U. S. Attorney's Office has become aware that Clem Hanney is due to be released on 23 March 1911. The U. S. attorney further states that there are indictments pending for Clem Hanney's connection to other post office robberies. The attorney notes that Clem Hanney has become a proficient brick-layer and it is recommended that he not be brought to trial on those indictments so long as he conducts himself properly upon his release. On 16 March 1911 the warden of Leavenworth responses back to the U. S. Attorney's Office that he has had an interview with inmate Hanney and has impressed upon Hanney what conduct is expected from him upon his release. 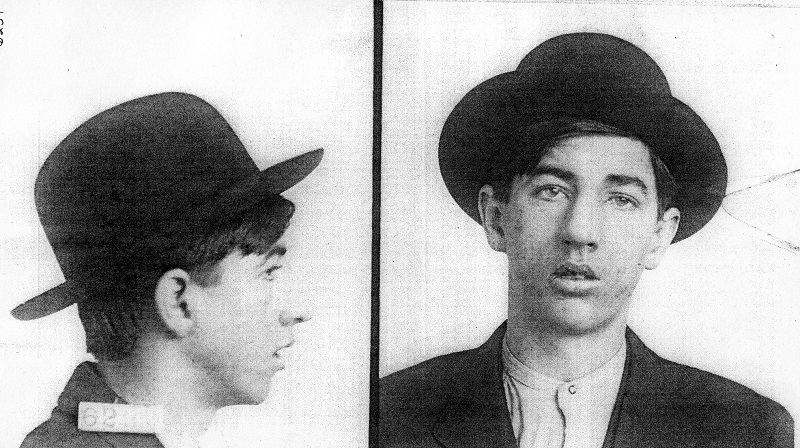 Clem Hanney is released from the penitentiary on 23 March 1911 at the age of 22 years, 4 months. Apparently Clem Hanney was released on his "Good Time" date and did not serve the full three years confinement of the 1908 sentence. While the file of Clem Hanney makes certain this is Clement Stephen Hanney, son of James and Nora, there is nothing in the file that proves that Clement Hanney is William Aloysius Brady. One final set of letters dated September 1912 is included in the file. The first is a request from the United States Marshall's Office for the prison record of Clem Hanney. The response from the warden of the penitentiary indicates a photograph, the Bertillon record and other information has been forwarded. I have just received the second package of information from the National Archives with the inmate files for the other Hanneys and Bradys at Leavenworth Penitentiary. The William Brady files and the Will Hanney file have no connection to Clement Hanney or William Aloysius Brady. However, the second Clem Hanney file is for the same Clem Hanney that was sentenced in 1908, and released on 23 March 1911. This new file shows that Clem Hanney was arrested a second time in September 1912 and held for investigation. 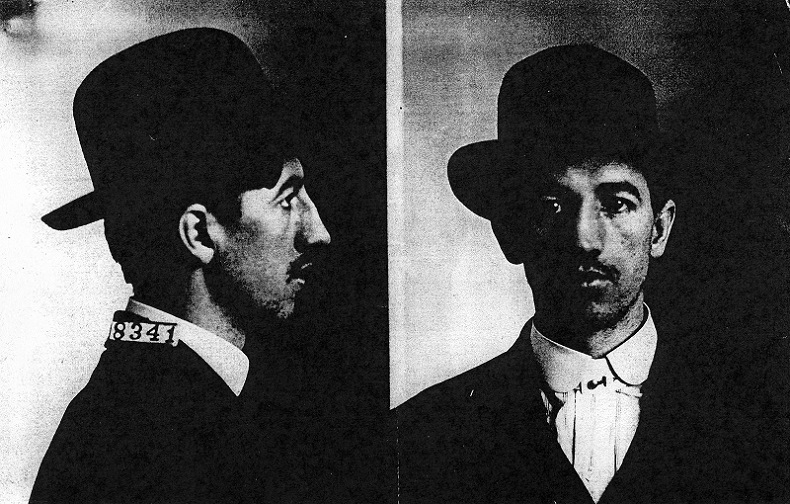 On 26 November 1912 Clem Hanney pleaded guilty to the charge of burglarizing a United States Post Office. He is sentenced to three years confinement at Leavenworth penitentiary to begin on 30 November 1912 with a release date of 29 November 1915. There is nothing in the file that indicates if the new conviction is a result of a new burglary or the old indictments noted in the 1908 - 1911 file. It's possible that a different U. S. Attorney's Office became aware of Clem Hanney and proceeded to bring up the old indictments even though the St. Louis U. S. Attorney's Office had passed on any further prosecution. The new file for Clem Hanney, inmate number 8341(mug shot), shows an occupation of bricklayer and residing in Peoria, Illinois. He states his father and mother are both living in St. Louis, Missouri, that he is Catholic and he was age 18 (approx. 1907) when leaving home. The 1907 date coincides with the remarriage of his father James to his step-mother Kate. The parent's St. Louis address is the same address found in the 1910 census for James, Kate, Leo, Loretta and Regina Hanney. Listed under habits are chews, smokes and drinks. A scar is noted on the left index finger and another scar above the left eyebrow. Also noted is a, "Tattoo of card, 5 of Diamonds, on base of left thumb rear". A full set of fingerprints is included in the file. The tattoo is the same tattoo noted in the U. S. Navy enlistment record for William Brady. While it could be argued that more than one individual could have the same tattoo, especially if they were known to each other, other information in the file pretty much establishes the fact that William Brady was Clement Hanney. Scars noted in the Clem Hanney file match scars noted in the William Brady Navy file. I compared the fingerprint records for Clem Hanney and William Brady. In my opinion they are identical. Clem Hanney's prison file notes problems with his teeth and so does the William Brady Navy file. Finally, the Clem Hanney file notes many instances of him being treated in the prison hospital for stomach and digestive problems. William Brady underwent surgery in the late 1920's for stomach problems. The prison work record for Clem Hanney shows him being assigned to the Brick Laying Gang and some time spent in the Shoe Shop. The mail log for letters sent and received show nothing from or to his parents. There are some letters to a Jessie Nothstein or Nothstern of Peoria, Illinois; some notations indicate it is a sister, another notation indicates it is a friend. Since the date of the letters is 1913 and his sister Loretta was born in December 1898 it is unlikely that the Jessie was Loretta. Loretta would have been only fourteen years old and too young to marry. Loretta would most likely still have been living with her father and step-mother in St. Louis, Missouri. Clem Hanney was released from Leavenworth penitentiary on 29 November 1915. There was no early release granted. Clem Hanney's "Good Time" early release was forfeited after an escape attempt on 20 June 1914. I assume that upon his release Clem Hanney decided to make a clean start by relocating to the west coast and changed his name to William Brady. In 1918 he voluntarily enlisted in the United States Navy, served his country in wartime and was honorably discharged in Philadelphia, Pennsylvania. William Brady, in a short period of time, became a successful building contractor as noted in his 1920 wedding notice. He married, started a family and became a prominent citizen in Conshohocken, Pennsylvania. Losing his business during the Depression years must have been difficult for William Brady considering the earlier mistakes and the successes achieved since 1918. William Brady was proud of the family he and his wife Mary Kehoe Brady had raised. During and after World War II William Brady was known to take his sons William, Jr. and James, both veterans, around town and introduce them. William, Jr. had enrolled in college before the start of World War II. After completing his first year at Drexel University he enlisted in the United States Army, finally becoming a pilot in the U. S. Army Air Corp. William Brady's second son, James, also joined the Army Air Corp serving as a gunner. After the war was over William, Jr. and James enrolled in and completed college utilizing the G. I. Bill. Daughter, Elizabeth, married at the age of twenty-one and in the next 5½ years had four children. At the age of thirty-three Elizabeth enrolled in college, continued to raise her children and graduated college with a teaching degree in 1971. Daughter, Margaret, was to become a nurse with a long career that lasted until her death at the age of eighty. Daughter, Anne, raised seven children, as did her parents, and has been said to spend the most time with her father. Daughter, Helene, and son, John, both had long careers at a local Conshohocken paper manufacturing company. Parties and family gatherings were a frequent occurrence at the Brady household both before and after William Brady's death in 1956. Some introductions were made that ended up in marriage and the children and grandchildren of William Brady will always remember the annual Thanksgiving dinners, Christmas parties and weekly visits to the homes in Conshohocken and Norristown, Pennsylvania. While Clement Stephen Hanney may have made some mistakes in his early years, William Aloysius Brady found his family in Conshohocken, Pennsylvania. In October 2006 I discovered the true story about William Aloysius Brady's background and previous life as Clement Stephen Hanney. The fingerprint records that were part of the Clem Hanney prison record and the fingerprint records that were part of the William Brady U. S. Navy file were identical to my untrained eye. To validate my conclusion I asked a family friend, and retired police officer, to have the two sets of fingerprints examined. The fingerprint records were submitted to and examined by a trained fingerprint analyst, and declared to be a match. This examination was repeated when another family friend, with F. B. I. connections, examined the fingerprint records and declared them to match. With two different members of law enforcement confirming my discovery I was now certain that I had found my grandfather, his family and his previous life in St. Louis, Missouri. In 2007 I used DNA testing to prove William Brady and Clement Hanney was the same individual. DNA from a living descendent of William Brady was tested against DNA from a descendent of Clement Hanney's brother, James. Of the 67 DNA markers tested, the results showed the two DNA samples matched on 66 markers. A match of 66 markers out of 67 is many times the number of matches used and required in current criminal and legal investigations. Here is a summary of the forensic and subjective evident used to confirm the William Brady - Clement Hanney identification. Back in October 2006 when I discovered that my grandfather William Brady was actually Clement Hanney I had many doubts about what I should do with the new information. Should I tell my mother that her father was somebody different from the person she knew? Should I tell my mother that her father had served time in prison? Should I tell my mother that stories she had heard from her father, and passed on to her children, were stories that had been fabricated to cover up a past life? For weeks I vacillated back and forth between tell and don't tell. I talked to some family members, and some said yes I should tell about my findings, and others said that I should drop it. Finally, in late November 2006 I realized that I had to tell the full truth about what I had learned. If I did not tell the full truth as I knew it, I would be constantly asked to confirm and repeat family stories I knew to be lies and I would be complicit in perpetuating untruths within our family. I could not sit there silently and agree, during conversations with my mother about her father, when I knew that things she believed were untrue. I needed to have a conversation with my mother, and I needed to have a conversation with my Uncle Jim's family. After those conversations in November 2006 I made the decision that I would tell the William Brady-Clement Hanney story to the rest of the family, but only up to a certain point. I decided I would make my theories of the Brady - Hanney family connections but I would not reveal the final pieces of evidence that confirmed my theories. William Brady's children would know the full story about their father but they did not need to have it openly discussed among extended family. The William Brady - Clement Hanney story may be fascinating to some family members but for others it is more personal, and disturbing, and emotional and could cause embarrassment. When I started my search for information about my grandfather it was to get to know him, to get to know his St. Louis family and how they lived, not to embarrass anyone by what I found. And so, now, I can put the ending on the story that was started in 2005 and partially told in 2006 & 2007. If you spend as much time as I have looking at the military record for William Brady, and the prison record for Clem Hanney, and talking to relatives who knew him I've come to know my grandfather a bit better than I would have from my faint memories and the family stories passed down. With the revelation of William Brady being born Clement Hanney some of those family stories will die. William Brady probably never played semi-professional baseball, as some thought. More likely his interest in baseball was from his childhood in St. Louis and the Sunday afternoon games he watched from the bleachers in the Leavenworth Penitentiary. William Brady's father did not own a construction company with his sons. His father was a "packer" in a St. Louis flour mill his entire life. William Brady's red or ruddy face did not come from Native American blood, but probably from spending 10 & 12 hour work days under a Kansas sun laying brick and stone to build one of the most formidable United States penitentiaries. William Brady's father did not die in a construction accident when William was a teenager. His father died in 1938 at the age of 82. There must have been a not often seen lighter side to William Brady, than the quiet man most people would comment on. While serving his time at Leavenworth there were infractions for laughing, joking and talking, all of which was forbidden. Prisoners were expected to serve their prison time in complete silence. William Brady enlisted in the U. S. Navy in Seattle, Washington, and in a few days was on a train to the East Coast and shipment overseas to France. During the cross-country train trip he left the train without permission. For that infraction, he had to appear at "Deck Court" and was fined $10. The military file does not reveal his reason for leaving the train without permission, but I'm thinking he had his sights on a pack of cigarettes or a bottle of liquor. When Clem Hanney arrived at Leavenworth Penitentiary, after his second conviction, he was examined by the prison physician. The physician removed a bullet "from a gunshot wound". The bullet had entered at the left sternum clavicle and travelled to the spinous process of the right scapula. Twelve months later he would be granted relief from brick-laying because of the gunshot wound. Ten months after that his light-duty ticket would be revoked when the physician noted that it "was no longer necessary and the young man was using it to avoid displeasing work". At some point in time Clem Hanney decided to leave behind the life that landed him in Leavenworth Penitentiary. Did that happen while he was stationed in France during World War I, or perhaps 1919 when he met Mary Kehoe, or maybe when his first son was born in 1922? William Brady built a lot of homes in Conshohocken on E 10th Ave, E 9th Ave, 1100 block of Fayette St, 1400 block of Fayette St, and many on Hector St. He built his and wife Mary's "Dream House" at 105 Spring Mill Ave, and then lost it during the Great Depression. By 1930, William Brady and his family were living above the Brown Derby restaurant they ran at 123 Fayette St in Conshohocken, Pennsylvania. The 1930's would have been tough years; the construction company was lost, but they operated the restaurant, seven children to feed and clothe, seven children to send to Catholic school and private school. In 1939 Mary Kehoe Brady's father died and in a short time after they would have to give up the restaurant. More tough times until World War II, and the Philadelphia Navy Yard was hiring. Bill Brady was again doing work he enjoyed, construction and building something, working with his hands. World War II provided work and relief from the Depression, but two sons were sent to war. One son was stationed in England and piloted bombing missions over France and Germany. Another son was stationed in Italy and a gunner on a bomber plane. There was a lot of pride but just imagine the worry and fear that came with it. The war ended, the boys came home, thankfully. Bill Brady could not be more proud of his sons. And now, his children started to marry and have children of their own; first Margaret, then Bill Jr, followed by Anne. The family was growing. In 1954 three more children married; James, Elizabeth and Helene. By now Bill Brady was sick a lot of the time. The old stomach and digestive problems from the 1910's kept him at home a good deal of the time. Some say the problems started again after losing his first son, Bill Jr., in a 1950 airplane accident while he trained for the Korean War. And the family was still growing, 6 of 7 children married, 15 grandchildren by the time Bill Brady died in 1956. He would not live to see his youngest son, John, get married. Even though Bill Brady was sick that did not stop the Hector Street house from being a center of activity. Mary Brady made sure of that when she hosted the Thanksgiving dinners, Christmas parties and weekly visits by her children's families to the home. William Aloysius Brady died 31 October 1956. We can't say for sure when Clement Stephen Hanney died. Was it 1915 when he was released from Leavenworth Penitentiary, and William Brady was born? Was it 1918/1919 when William Brady was serving his country in France during World War I? Was it 1919 when he met a girl from Conshohocken who came down to the Navy Yard to greet the "boys" coming home from war? Somehow, I don't think Clement Hanney ever left Missouri and Kansas, I think he died there and William Brady was born. William Brady wandered from Missouri and Kansas, maybe to California and then Washington state, to France and then to Philadelphia. He found Conshohocken, he found his life, he found his family, and he stayed. Mary Kehoe Brady, the person who knew William Brady for more years than anybody else, said of him, "He was a good father and a good husband." and now they're out, but you have no reason to be ashamed. importance of love of family, and they have passed it on to their children. important what they do after.